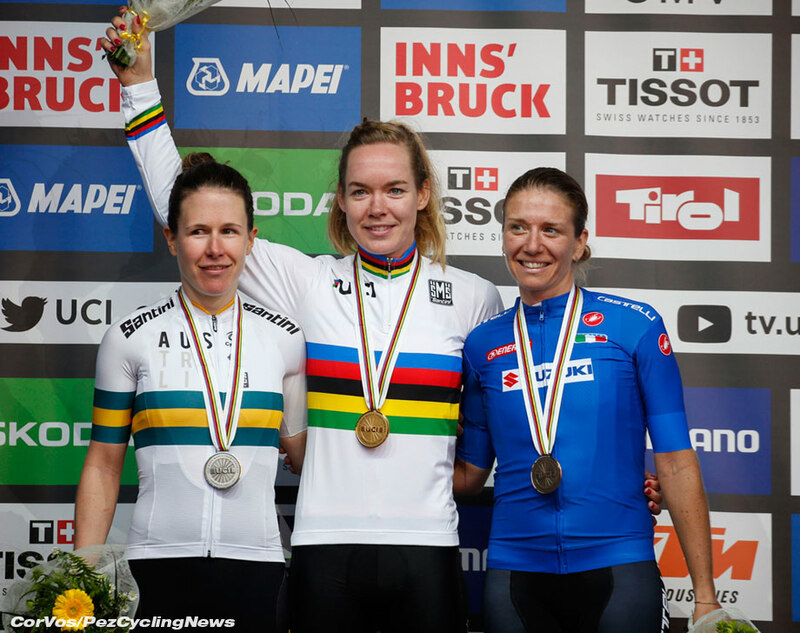 Women's Road Race: Anna van der Breggen will wear the rainbow jersey for the next 12 months after a monstrous performance in the women’s world championship road race in Innsbruck. By the finish, the Dutchwoman was so far ahead, you’d almost need a calendar to measure the gap to silver medallist Amanda Spratt from Australia, and Italy’s Tatiana Guderzo in bronze. Van der Breggen has had a stellar, Classics-peppered season, even if she has missed a number of key victories. She came into the race as the perceived co-favorite alongside Annemiek Van Vleuten, and she delivered on her status, not letting up the pressure for a second. On the penultimate lap, after a short, probing attack from Van Vleuten, it was van der Breggen who ripped away from the peloton, reached the escapees, and then powered away. Once that happened, the result was never in doubt with almost 40 kilometers to go. As the riders line up, most of the smart money is landing on the Dutch … inevitably. 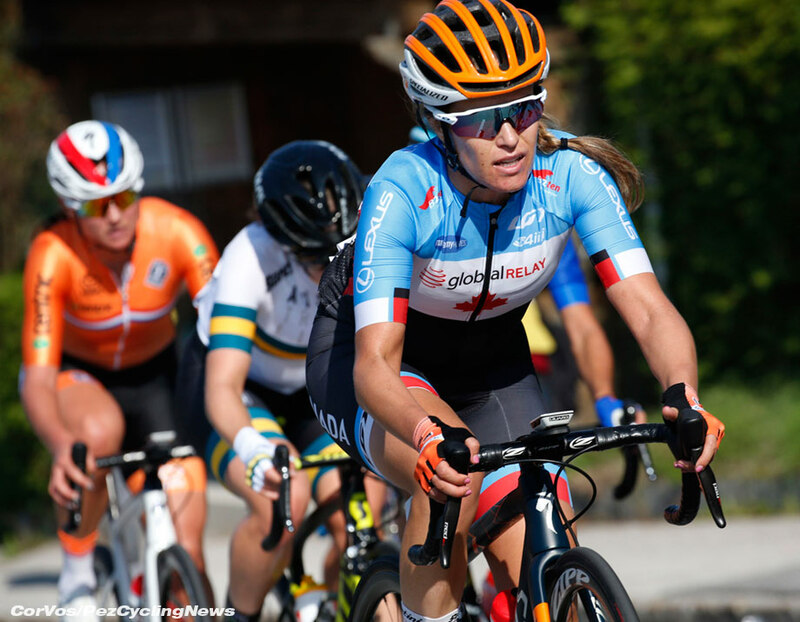 World TT champion Annemiek Van Vleuten has been in breathtaking form this season, storming through the Giro Rosa, and Anna van der Breggen, winner of practically every Classic this spring, plus Strade Bianche, are the stand outs. Defending champion Chantal Blaak can’t be counted out, but the course isn’t suited to her. Ace South African climber Ashleigh Moolman Pasio and the on-form Kasia Niewiadoma for Poland are favorites. Australia bring Amanda Spratt to the party, having had a strong season and Denmark’s Cecilie Uttrup Ludwig is in with a shout. 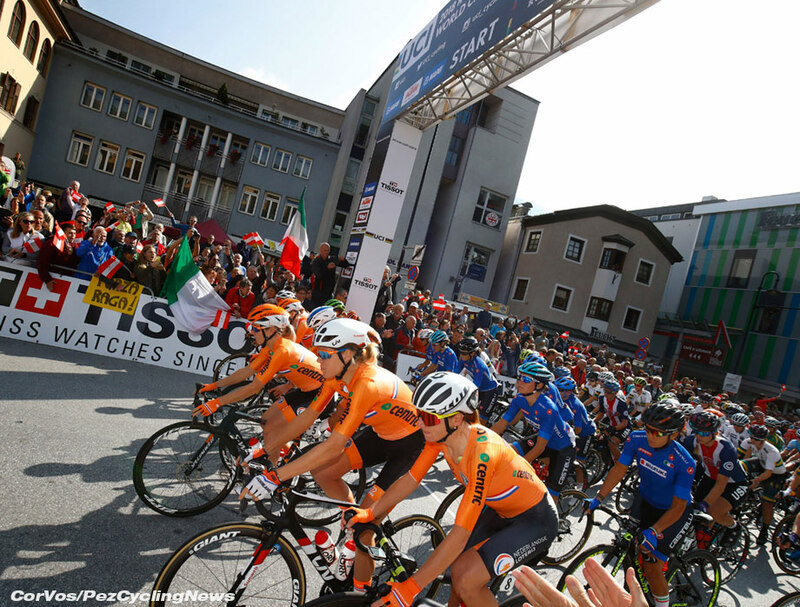 Potential outsiders who could exploit any tactical misfire from the favorites include Katie Hall for the USA, mountain bike star Jolanda Neff (Switzerland) and – strange to say given her record – Elisa Longo Borghini for Italy. 156 kilometers, starting in Kufstein, and throwing in over 2400 meters of altitude gain. There will be about 85 kilometers heading south-west towards Innsbruck – relatively flat but with a climb at Angerberg, and then a steep, 14% hike at Gnadenwald. The action should really kick off on three trips around a 24-kilometer finishing circuit which includes a climb of 8km, at an average of 6% at Igls. Katie Hall (USA) has a crash and mechanical, then a trip to the medical car, but gets back into the peloton. Aurelo Nerla for Poland goes away in the first big attack, joined by Ana Cristina Sanabria (Colombia). Finland’s Lotta Lepisto and Denmark’s Emma Norsgaard counter, as the front duo stretch out to a 2’20” lead. 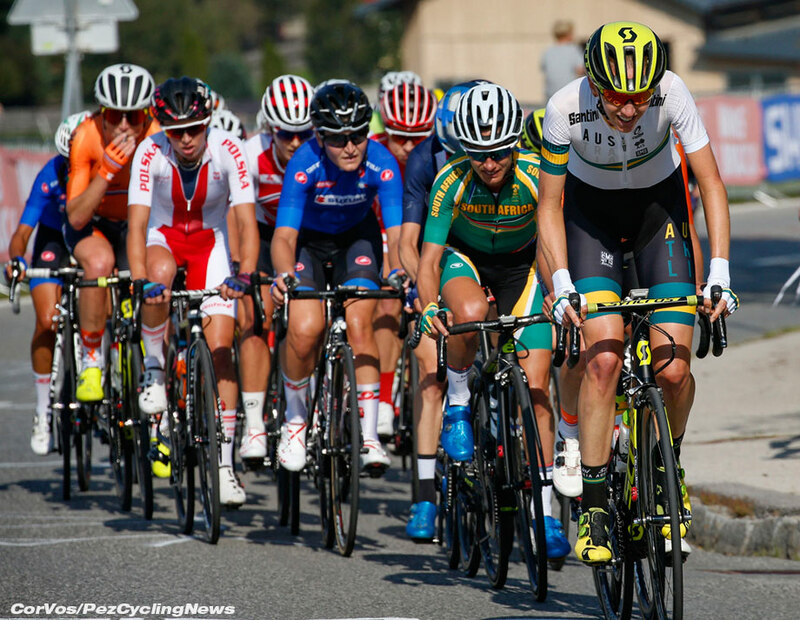 60kms gone and a big crash takes down the Dutch duo of Ellen Van Dijk and Annemiek Van Vleuten along with Team GB’s Dani Rowe, then Amanda Spratt fell a few kilometers further up the road, but no serious damage done. The lead changes as we see a strong quartet of Lepisto, Tatiana Guderzo (Italy, ex-world champion), Ellen Van Dijk and Emma Norsgaard. The first climb of Igls starts to cause mayhem, as Australia through Lucy Kennedy help to drive the race. Coryn Rivera (USA) attacks on the climb and prompts a chase, and we see a new – and impressive – breakaway formation. Lucinda Brand (Netherlands) then tries to jump away to close the gap as Van Dijk begins to fade. The lead stretches out towards 1’16”, but as Brand is caught, Van Vleuten goes. It doesn’t look full gas, but it draws out a number of contenders, and immediately Anna van der Breggen jumps. The star of the spring classics rides away, legs thumping round. She catches the leaders in less than two kilometers and goes straight to the front with only Spratt and Rivera able to hang on. van der Breggen spins a far smaller gear; Spratt churns the pedals round as Rivera falls back. Hitting 39 kilometers to go, van der Breggen piles on more pressure and Spratt is dropped; it’s clear that the Olympic champion is on a mission. She’s had too many second places this year (Euros TT, Worlds TT, La Course) and a disappointing result at the Euros road race. The chase looks to have given up – the main field crosses the top of the climb over 1’50” back. The architectural details of the stunning Innsbruck city centre are picked out by spears of autumn sunshine as the Alps tower high above. Nothing is as sensational as van der Breggen’s performance. Inside 28 kilometers to ride, and Spratt is a minute back, Rivera is doing a fine job but is third at over two minutes behind and the peloton has resigned, almost three minutes back. 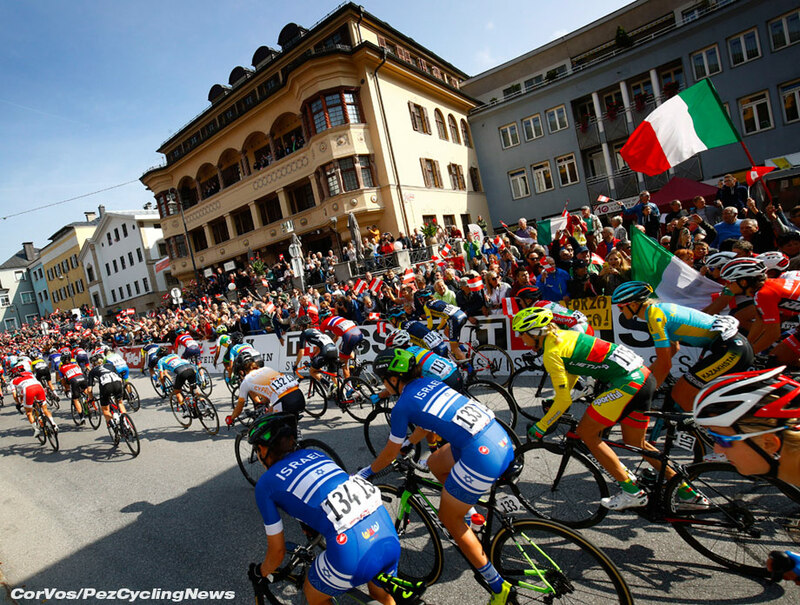 Last lap, 24 kilometers to go – Kasia Niewiadoma tries to inject some pace as the peloton comes into Innsbruck. Spratt takes the bell 1’19” behind van der Breggen. Fahlin and Jasinska catch Rivera and that trio cross at 3’06”. Karol-Ann Canuel (Canada), Guderzo and Amy Pieters (Netherlands) clip off the peloton which meanders over the line a staggering 4’23” behind. van der Breggen thunders through Dutch corner, all the names of the men and women competing painted across the road. She doesn’t seem to notice the noise as she pushes the gap to 1’50”. Gold and silver are sorted – the battle for bronze heats up as Pieters, Guderzo and Canuel catch Fahlin, Jasinska and Rivera. The American and the Dutch rider start to slip as Canuel drives this small group, then Guderzo rips away to try and get the final medal. 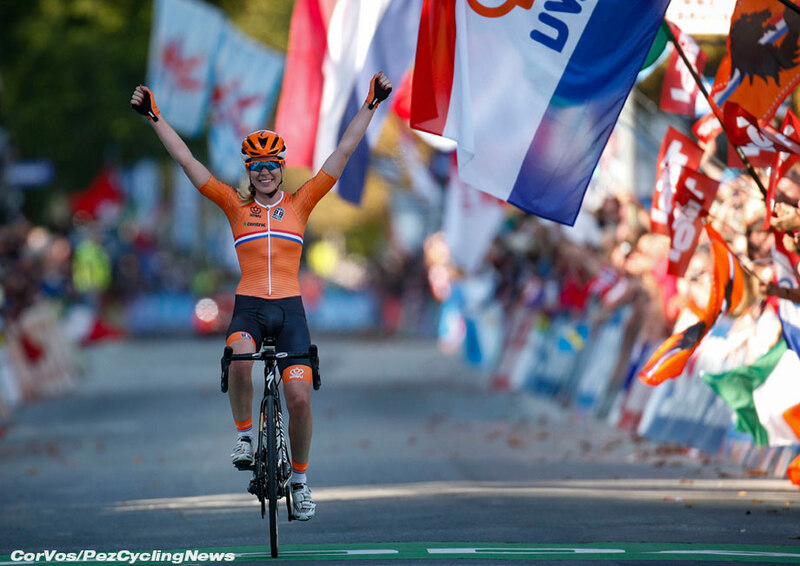 The last lap is simply a parade for van der Breggen, hammering to the line, and then bursting into tears as she realises that the one big road race title she’d missed is finally in the bag. Quite simply … phenomenal. Spratt came second almost four minutes back, and Guderzo in third completed a career set of gold, silver and bronze at the worlds. 25. Leah Kirchmann (Canada) at 8:18.